Resonance ...: Anthony Hopkins,Ventriloquism - Scared ?? Anthony Hopkins,Ventriloquism - Scared ?? 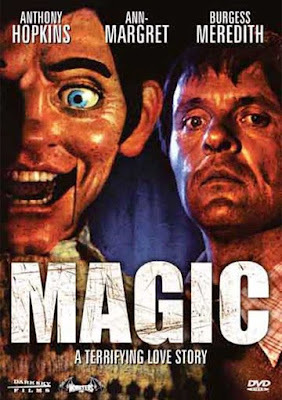 When I first watched "Avargal" (A tamil film starring Kamalhaasan and Rajinikanth),one of the most important aspects that captivated me is the ventriloquist-dummy of Kamalhaasan.I had a natural inclination for cinema exploring this complex psychological phenomena,Ventriloquism.And "Magic" is one of the rare films that deal with this and will definitely leave you with a horrified psychological experience. Corky (Hopkins) is a amateur magician performing card-tricks.He is a failure as a magician until he gets the audience's attention with his dummy (Fats - Corky's ventriloquist dummy).He is about to turn pro of some kind but develops a psychological complex and intentionally shy away from his professional success.The story gets personal from here on - he meets his childhood sweetheart Peggy (Ann-Margaret),gets more involved with his dummy that eventually takes control of him - will form the rest of the plot. There's absolutely no cats or crows or ghosts to horrify oneself in this movie.Its the mental trauma of the protagonist and a gripping music that will create a eerie shell around and will develop a mental disturbance in you.The film has to comfortably rest on the performance of the lead actor and Hopkin's performance and facial expressions are greatly appropriate.Ofcourse, we know him through his more popular later films,as Hannibal Lecter. The film is technically great - Camerawork,Music,Editing - Brand Attenborough throughout. So...Why Pick up the DVD? Richard Attenborough - We know him for his biopics and historical films.Watch him direct a thriller. Videsh:Heaven on Earth (2008) - Surrealism !!! Godmother (1999) - Rambhiben ki Jay !! !